Mr. Cao Goes to Washington premiered January 2013. The journey of Rep. Joseph Cao, the first Vietnamese-American elected to Congress. What happens when the naiveté of a political rookie clashes with the realities of racial politics in the American South and ultra-partisan struggles in Washington D.C.? Mr. Cao Goes to Washington follows the journey of Rep. Joseph Cao, the first Vietnamese American elected to the US Congress, the only non-white House Republican of the 111th Congress, and the only Republican to vote for President Obama’s Health Care Reform Bill. following discussion with members of Congress about immigration reform, June 25, 2009. A former seminarian and an idealistic attorney from the small but well-respected Vietnamese-American neighborhood in New Orleans, Anh “Joseph” Cao enters the political arena hoping to affect greater good. Having never won an election, Cao scores a stunning upset by unseating a nine-term incumbent mired in a bribery scandal to capture a Congressional seat in just his second run for public office. Thus begins the political paradox that is Representative Anh “Joseph” Cao, a grassroots activist and social progressive who believes in immigration reform, gay rights, and government services for the poor, who is also an adamantly pro-life Catholic that allied himself with the Republican Party. Cao has an appealing combination of earnest naiveté, integrity, and passion, but, as a Vietnamese American backed by wealthy white Republicans in a district that is 65% African Americans and 75% Democrats, Cao struggles mightily with partisanship and racial politics in order to be an effective Congressman. While on the House floor, Cao speaks frequently about overcoming partisan and racial differences. 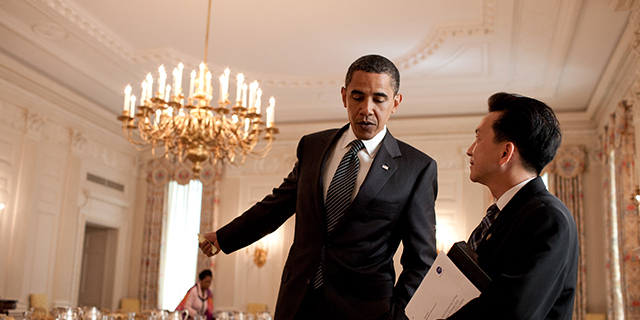 True to his centrist beliefs, Joseph Cao begins to build a record as the most liberal Republican in the House and, in the process, striking up a cordial friendship with President Obama. The freshman Representative gains his biggest notoriety when he becomes the only Republican to support the initial Healthcare Reform Bill. Cao insists that his vote is based solely on the needs of his district. Critics suspect that Cao breaks rank to please his heavily Democratic constituency and improve his odds for reelection. Either way, Cao emerges as one of the few non-partisan voices in the ultra-partisan Congress. Cao is soon walking a tightrope and discovers that his efforts at bipartisanship draw fire from all sides. His “yes” vote on the first Healthcare Reform Bill puts him in the limelight, but also subjects him to scrutiny. Ultimately, Cao votes against the final bill, citing inadequate language to prevent funding for abortion. Cao, staunchly anti-abortion, insists that he voted with his conscience, while acknowledging his vote may have not been in the best interests of his district. Many believe he ran back into the Republican fold after his campaign money dwindled. As his reelection gets underway, Cao is candid about the odds against him. When he is among his African American constituents, Cao highlights his personal relationship with the President, and then is made to feel the fool when Obama endorses his Democratic challenger. This turn of events triggers a downward spiral in which Cao tarnishes his good-guy image by launching personal attacks on his opponent. Does Cao keep the flame of non-partisan unity alive deep down, or has he decided to play the game of politics-as-usual? Will Cao survive with his integrity and idealism intact? Mr. Cao Goes to Washington is portrait of a complicated man navigating the fascinating, high stakes world of electoral politics, New Orleans style. Mr. Cao Goes to Washington was produced and directed by S. Leo Chiang.